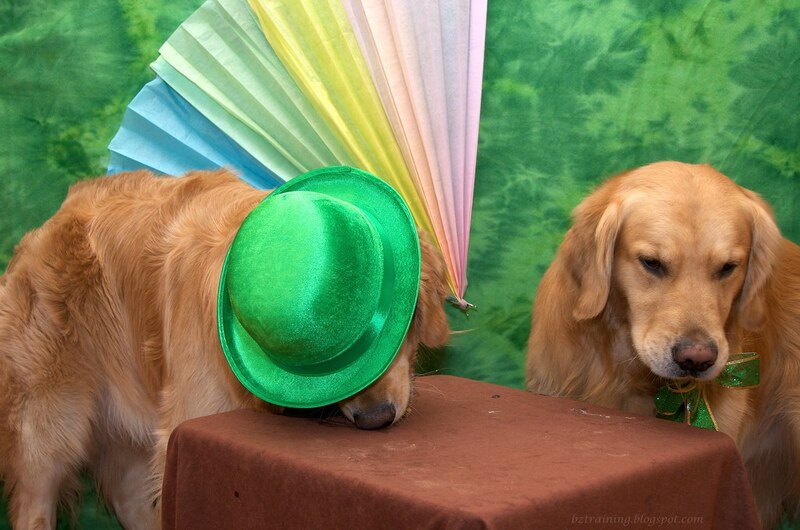 Dog Blog Post #630: (No) Bang for the Buck. That's what I should have titled today's post. As in, short of it ending up on the cover of Time or National Geographic, this shot was definitely more work than it was probably worth. Things started out OK. When I mentioned to hubby the need to go over to the craft store to see if I could pick up a cheap black "cauldron", he asked if one of his Dutch Ovens would do. Woo-Hoo! Why, it most certainly would! Score! And the hats and bows and background fabric and even cookies were all pre-existing in the house. My goodness, how lucky is that? I'd be done in no time. Still, the setup seemed a bit lacking when I pieced it together in my head. It needed... a rainbow. But of what? I have no rainbow fabric, no rainbow paper... hmmm... After thinking on it a bit, I decided to pick up some tissue paper. It's cheap, relatively easy to work with (I hoped) and readily available (I thought). So off to the craft store (nope, didn't have any) CVS I went. Alas, I wasn't able to find really good colors. Just a multi-pack of easter pastels (pink, green, and blue sheets) to which I added a pack of yellow. And while I'm a failure at origami, I did manage to fold, tape, and butterfly clip together something kinda rainbow like - in an easter, congratulations-on-your-baby sort of way. Back home again, I started to work on the cauldron. I lined it with plastic wrap (to keep the cookies away from the well oiled pot), put a closed tupperware bowl inside to take up volume, wrapped some garbage bags around it to take up yet more volume, then dumped two boxes of cookies on top. 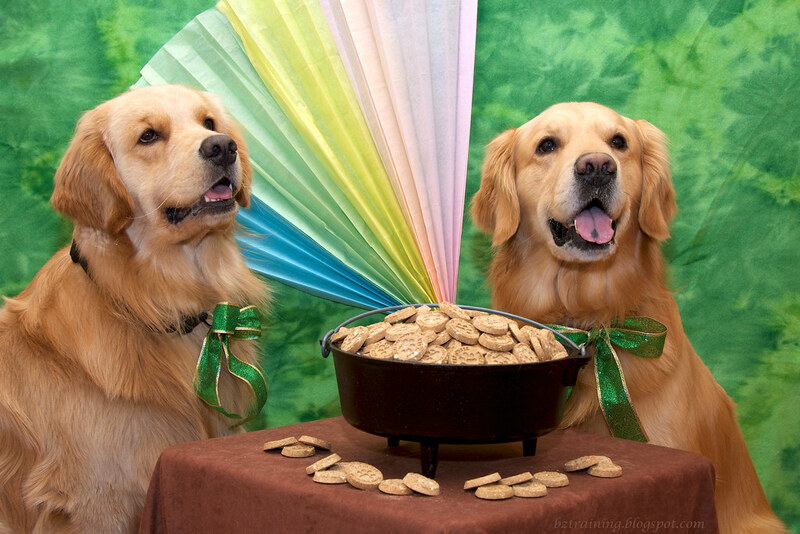 In the end, after getting everything setup and taking a few test shots sans dogs, I ended up moving all the cookies to the front half of the pot, as the angle of the camera made the back half invisible and it made the bowl look more generously filled. Anyway - the point is, over an hour later, everything (including lights, camera, and tripod) was in place but the boys. That's when things got interesting. Down came the baby gate, and they shot into the kitchen with me barely able to bellow out a "Leave it!" I rounded the corner to find Zachary had already snagged a cookie and Henry was inches away. Another "Leave it! ", a dirty look for Zachary, a "free" cookie for Henry (since had obstained), and things settled down. I slipped on their collars with bows and motioned for them to get in place. Seems that despite their having been confronted with many food enticements before, this one might have been a bit too much - particularly for Zachary. 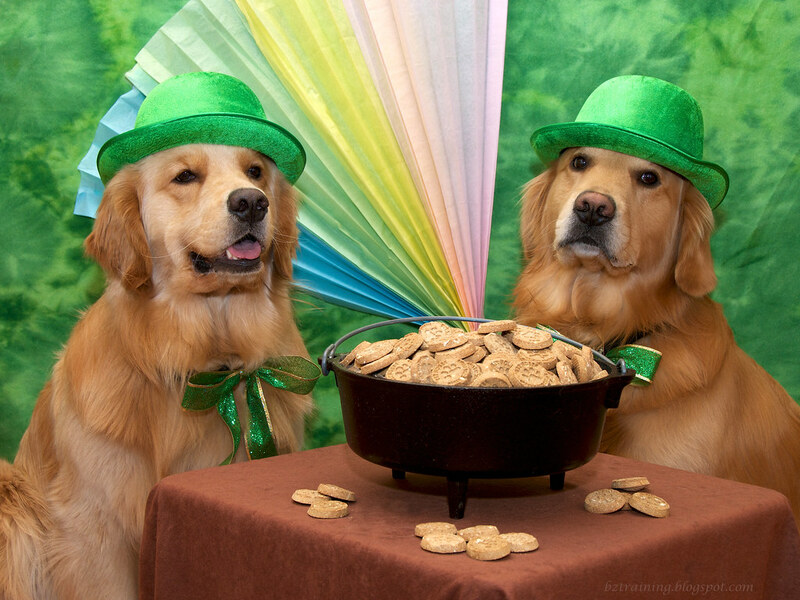 True, when I leaned over the cauldron to wipe the stream of drool from his mouth, the scent of the cookies was practically overpowering to my feeble nose. Still, they are just cookies. You'd think... but no. Zachary was incapable of turning off his salivary glands and drool practically poured out of his mouth for the entire shoot. Good thing Aperture has a clone tool. Slid the brown fabric so a fresh (undrooled on) bit was on top, put the cauldron back, sprinkled yet more cookies around the edge, got the boys back in place, added the hats, and took a few more (those up top). ... yup, they did - for a second time! Daily Dog Challenge "138. Go Green! 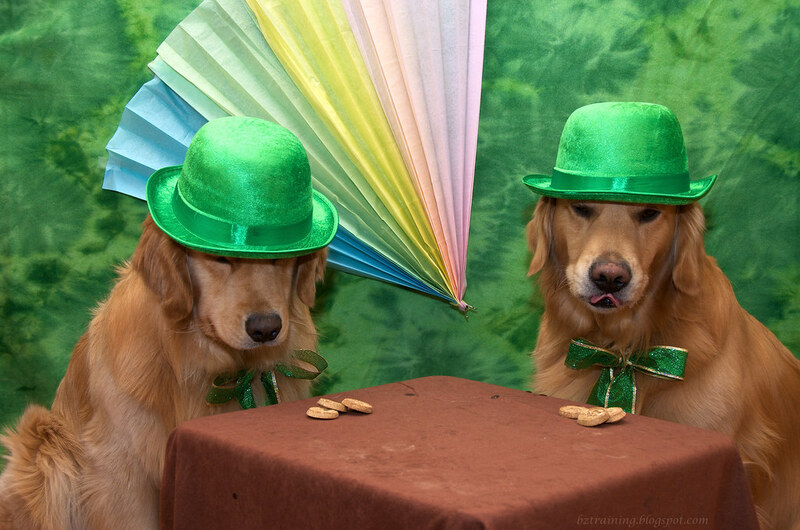 In honor of Saint Patrick's Day take a photo that features the color green with your dog. Remember to celebrate the holiday safely!" Our Daily Challenge - Mar 17. 2012 - "Myths and Legends"
100 Pictures - "#79. Green"
Woohoo! 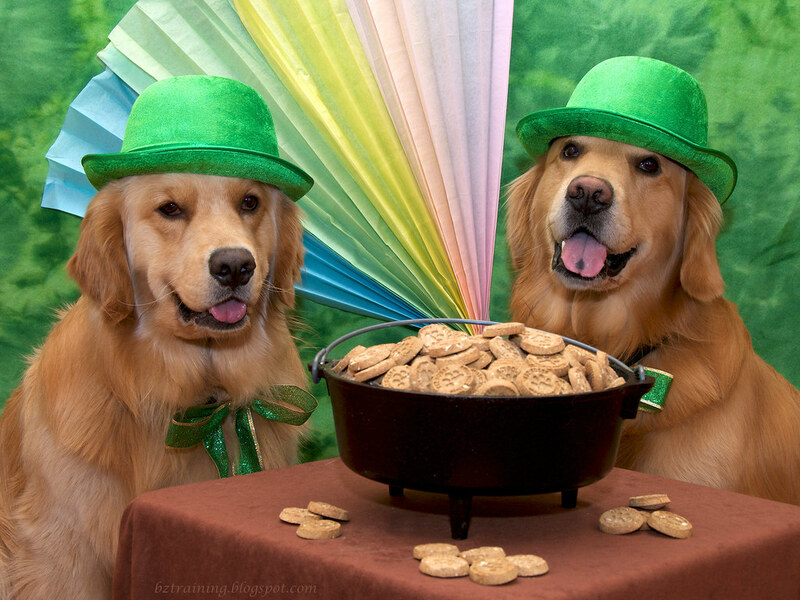 Now that is a pot of yummy gold!! nice and festive...and pot of gold for the boys!! Ha ha ha! I think we've all had times when a simple set up just got so much more complicated than we imagined it could. My Scrabble picture with Bunny and Morgan comes to mind. That thing should have hit Explore just for all the grief it caused me! The boys look adorable, though, and I think the end result was at least worthy of all the work that went into it! 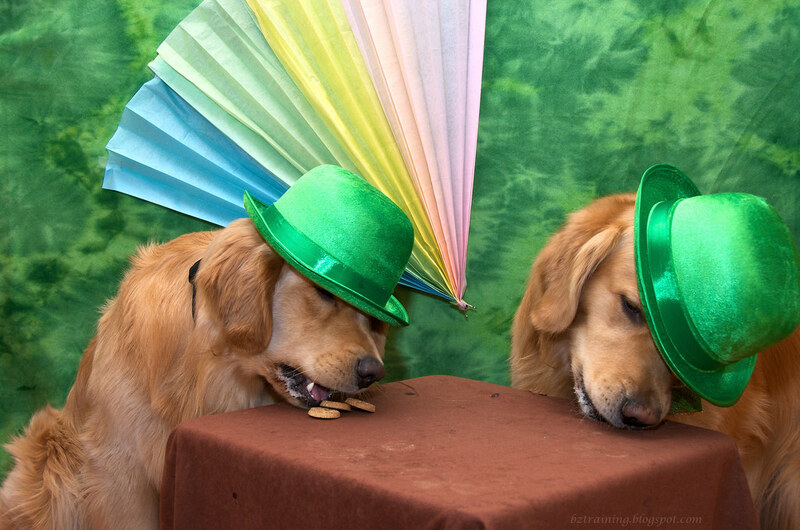 I'd love to find Zac and Henry at the end of any rainbows =D Zeus wouldn't have lasted 3 seconds of leave it with all those cookies ! Love the expressions in the 2nd pic most!